A great way for your kids to participate in the ride through the city. Welcome to the world famous, Onderwater family tandem. A great way for your kids to participate in the ride through the city. Kids sit in front and they can pedal, when then they feel like it, thanks to an innovative independent drive system. You can also add a second child seat and foot pegs behind the adult rider and even add a bobike maxi or junior to the rear. 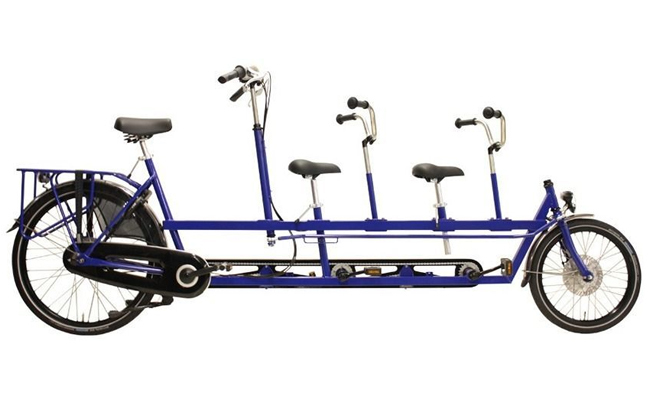 The tandem bike comes ready to ride with fenders, enclosed chain, strong rear carrier, coat guard, lights and a beautiful bell. On behalf of the acrobatic rigging design team and Cirque du Soleil, we would like to thank Andrew Bowen and the gang at Urkai, for the great support and partnership, by supplying us with a beautiful trike for our new Las Vegas production. Thanks again for all the help.